Hancock was the only one of Capt. Hancock’s four sons who was determined to pursue the horse business. After education at Johns Hopkins and University of Chicago, the 6 foot, 6 inch young man returned to Ellerslie, and in 1909 took over its management. A year earlier, Arthur had married Nancy Tucker Clay, who inherited land in Kentucky. The property was christened Claiborne, and the farm was launched in 1910. The Hancocks had moved the main operation to Claiborne in 1915, although the family continued to operate Ellerslie for many more years. All of this came about during a difficult era for the Thoroughbred industry. Racing in New York had been banned in 1911 and 1912 by anti-gambling sentiments, and the ripple effect of that ban had devastated the breeding industry. In response to those tough times, Hancock reduced the size of his broodmare band, but vowed to maintain what he had left as long as he could. He achieved his goal, and two years later racing in New York was restored. CELT became the first Claiborne stallion to lead the Sire List in 1921. That same year, Hancock paid $25,000 for the stallion Celt in the dispersal of James R. Keene’s Castleton Farm. This acquisition tells much about Hancock’s approach at the time: Well-bred, but not at the top of fashion, so as to be affordable for a working farm. 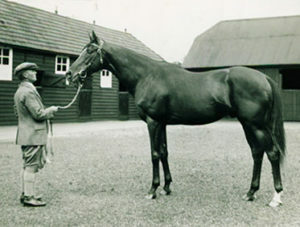 Celt became the first of the farm’s stallions to lead the sire list in 1921. 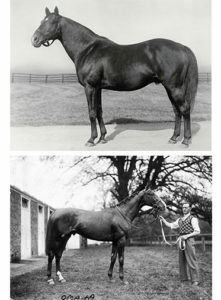 Although Celt died young, he sired 30 stakes winners of which 21 were bred by Hancock. Celt was followed by Wrack from a long line of Lord Rosebery’s mares. He had plenty of pedigree, but he had been moderately successful at the races. 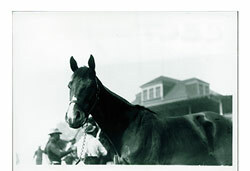 Wrack ranked among the leading sires for several years, and included in the dozen stakes winners Hancock bred by him was Careful, co-champion juvenile filly of 1920. Hancock attracted an impressive number of major businessmen to business, not only to buy yearlings but to board mares at Claiborne and, on occasion, make possible the importation of European horses. These clients included Chicago merchant Marshal Field, Nabisco executive Robert A. Fairbairn, and New York banker William Woodward Sr., plus the Phipps family. Hancock became their bloodstock adviser in addition to the other aspects of the relationship. French Classic winner SIR GALLAHAD III (top) sired American Triple Crown winner GALLANT FOX in his first crop. GALLANT FOX also stood at Claiborne, his son OMAHA (bottom) won the 1935 Triple Crown. Woodward, Field, and Fairbairn made possible the most important acquisition of Sir Gallahad III in 1926. Purchased for $125,000, Sir Gallahad III had won the French 2,000 Guineas and placed in the French Derby. Sir Gallahad III led the sire list four times and, in due course, led the broodmare sire list 12 times, including 10 years consecutively (1943-1952). Sir Gallahad III sired Woodward’s 1930 Triple Crown winner Gallant Fox in his first American crop. Gallant Fox was out of Marguerite, a mare which Woodward had purchased from Hancock. A similar sequence accounted for Triple Crown winner Whirlaway as well. Warren Wright Sr., of the emerging Calumet Farm, was among investors who made possible Claiborne’s acquisition of Epsom Derby winner Blenheim II. The horse cost $250,000, double the price paid for Sir Gallahad III. Blenheim II sired a Triple Crown winner in his first crop at Claiborne, the Calumet-bred Whirlaway. He was out of the mare Dustwhirl, who had also been purchased from Claiborne. Hancock was the breeder of record of 138 stakes winners, including 10 champions – Careful, Cleopatra, St. James, Nimba, Current, Forever Yours, Tintagel, Jacola, Brother Jones, and Beaugay. Among horses he bred in partnerships was 1947 Kentucky Derby winner Jet Pilot, bred by Hancock and Mrs. R. A. Van Clief. Hancock was the leading breeder by earnings five times, in 1935, 1936, 1937, 1939. and 1943. The stallions under his management which led the sire list at least once were Celt, Chatterton, and Sir Gallahad III. In 1945, Hancock suffered a heart attack, and in 1947 came the first of a series of strokes. His son came home to help run the farm. Arthur Hancock Sr. lived on for another 10 years; he died on April 1, 1957. Epsom Derby winner BLENHEIM II stood at Claiborne and was the sire of 1941 Triple Crown winner WHIRLAWAY. Hancock had been willing to provide leadership to the industry. In 1922 he had been elected president of the Thoroughbred Horse Association, a forerunner of the modern day Thoroughbred Owners and Breeders Association, and he was chairman of the executive committee when the Grayson Foundation was established in 1940 to support equine veterinary research. When World War II travel complications discouraged Kentucky breeders from sending yearlings by train to Saratoga, Hancock helped organize Breeders’ Sales Company, which later became the Keeneland Association. 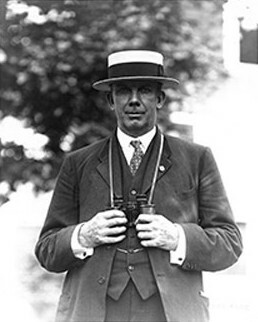 Hancock was one of the original voting trustees of Keeneland and served on the Kentucky State Racing Commission. His support of the Paris, Kentucky community surrounding Claiborne included 18 years on the board of education. In 1944 Hancock became the first of three generations of his family to be Honor Guest of the Thoroughbred Club of America.